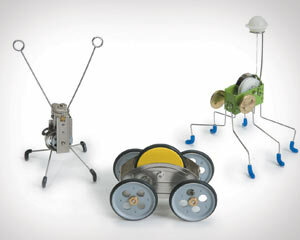 Kids and kids at heart won’t be able to keep their hands off Kikkerland’s futuristic toys. Melding function and fantastic design, the toys are high-style gadgets powered by rudimentary robotics like wind-up keys and string pulls. Our faves? The spider-leggy Oahaca Pull String ($13.95); Cranky, who doubles as your private desktop dancer and holder of a special photo, love note or reminder to buy milk ($11.95); and the turbo-torque Zecar ($14.50), whose traction can switch from front to back and whose royalty proceeds contribute to the reforestation of the Atlantic Tropical Rainforest, the most critically damaged rainforest in Brazil. Toad Hall, Petoskey, 231-347-5322.